Late afternoon jazz dance. All photos by Marc PoKempner unless otherwise credited. to a fair that mixes popular and specialized performances at a range of boutique venues. Produced by an independent 501c3, the 11-year-old Hyde Park Jazz Festival receives some support from the University of Chicago’s Office of Civic Engagement, and has co-founders in principals from the Hyde Park Jazz Society but relies for funding on grants it applies for on its own and solicited individual giving. 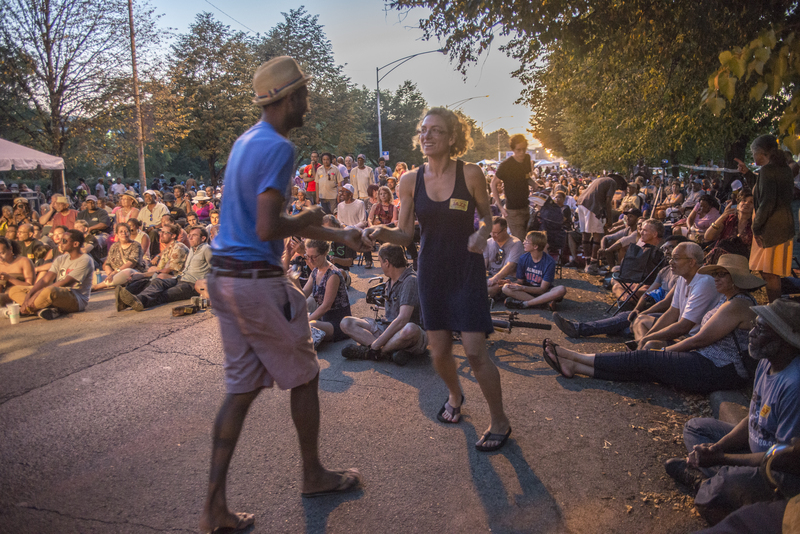 The fest occurs mostly on the U of C campus, which strives to be more inviting to its surrounding black residential neighborhoods than it’s been for decades. The efforts seems to work — a racially integrated crowd of several thousand, skewing middle-aged but including students (the term had just started) and families with kids, attended, all free of charge ($5 donations were encouraged). Some set up discreet tents, inflatable loungers or camp chairs within hearing distance of the outdoor stages at either end of a pedestrian mall on the Midway, socializing while taking in sun and street food. 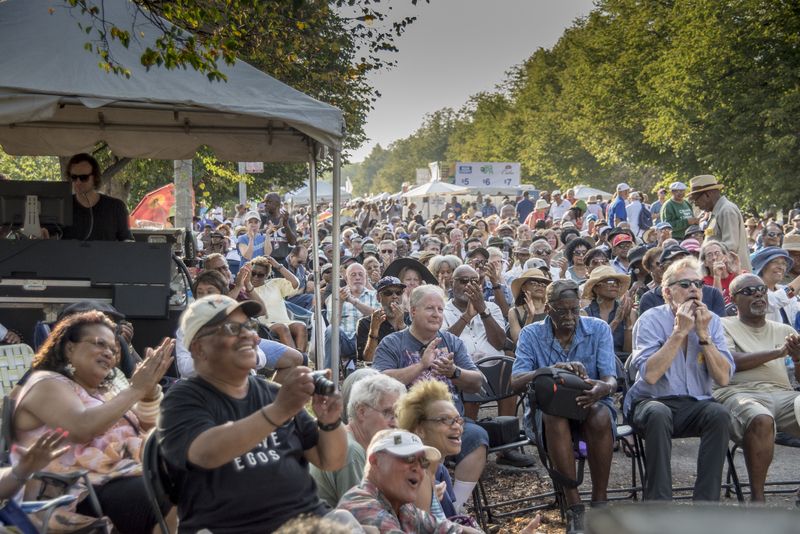 Others took refuge in the darker, cooler venues of the Logan Center for the Arts, the DuSable Museum, the Smart Museum or the Little Black Pearl art and design center on 47th St.
Hyde Park Jazz Fest audience in the Midway. No way to be everywhere, hear everything. My idea of fun. balafon virtuoso Fassery Diabaté and singer Fatim Kouyaté with Chicago vocalist Mankwe Ndos,bassist Josh Abrams, percussionist Jovina Armstrong and former Chicagoan guitarist Jeff Parker. This was swaying, tuneful music, superficially light as a breeze but with transparent, undulating layers of activity. I presented Ms. Mitchell with the Jazz Journalists Association’s 2017 Jazz Award for Flutist of the Year — it is her eighth consecutive such honor — and she accepted it mirthfully before the performance. As always, her personal improvisations are melody-rich, and she performed one solo that was genuinely edgy, pushing her instrument and the song’s formal limitations, too. See Lauren Deutsch’s photos of Nicole Mitchell for apt visualizations of her music. The cross-cultural ease of Bamako*Chicago Sound System’s ensemble is heartening. A few blocks away, at the Hyde Park Union Church, Amina Claudine Myers performed gospel songs from her childhood on piano. I only heard part of the performance, I think she played organ and sang, as well. 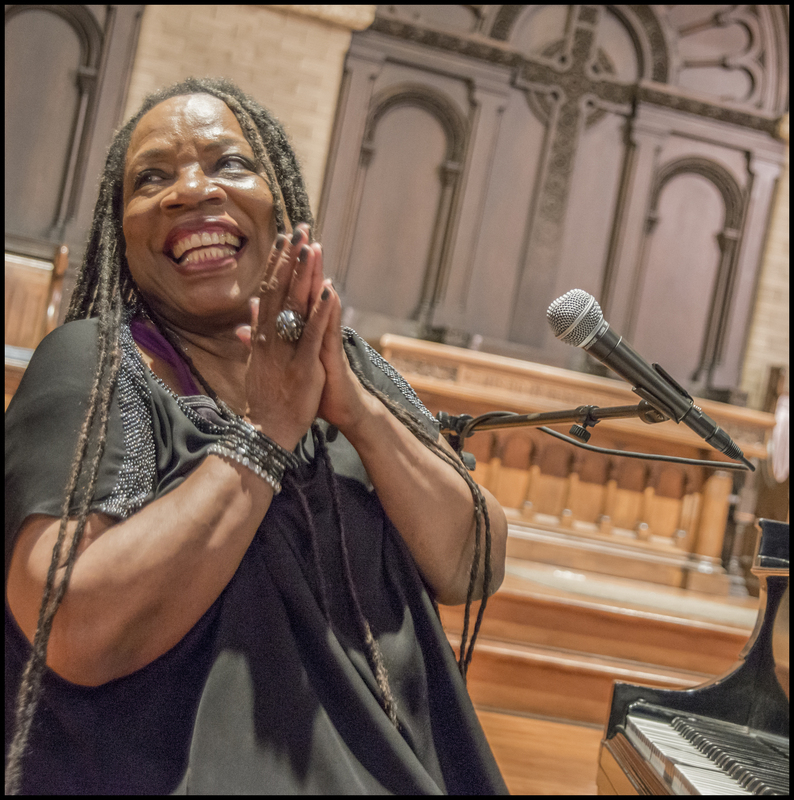 Myers, a foundational member around 1965 of Chicago’s Association for the Advancement of Creative Musicians is still active in its New York chapter, though she’s less well-known than many of her AACM cohort. Her experience with her spiritual material is undeniable, and of course it imbues jazz. 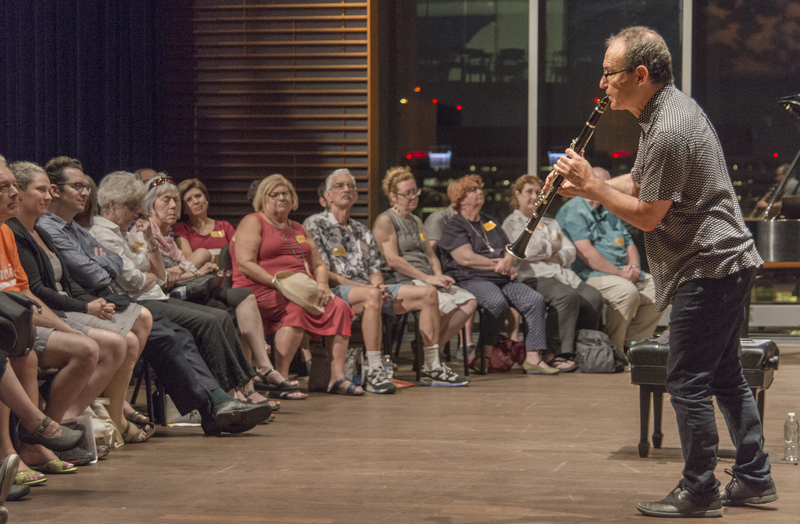 Clarinetist Ben Goldberg, from the Bay Area, cast a secular if similarly ethereal ambiance in the Logan Center performance penthouse (9th floor looking towards the Lake) when night came on. He considered compositions of Thelonious Monk, 100th birthday boy/immortal genius. Almost a third of the full house cleared out after the second long episode in which he thoughtfully deconstructed such compositions as “Work,” “Ask Me Now,” “Mysterioso” and the hymn “Abide with Me.” Said Goldberg, “I understand, solo clarinet is not for everyone,” and when the room had re-settled, added, without rancor, “The lightweights are gone.” His evocations of Monk’s themes, phrase by phrase, started at high point of understanding and went up from there. 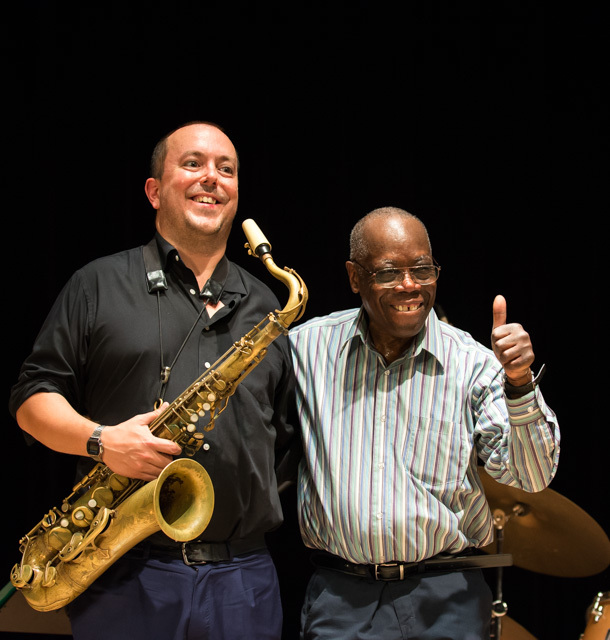 led and recorded several distinctive ensembles from the ’70s through last year’s The Declaration of Musical Independence featuring guitarist Bill Frisell, synthesist Richard Teitelbaum and bassist Ben Street, as well as Trio 3 with reedsman Oliver Lake and bassist Reggie Workman, and this duet project with McHenry (recorded as Proximity). I’ve known Cyrille personally since profiling him for DownBeat in the ’80s. I traveled with him briefly in the Soviet Union, invited him to address Jazz Journalists Association meetings at the New School Jazz program (where he’s taught for decades) and do lecture-demonstrations at my NYU classes. His distinctive strengths are embedded in the extraordinary range and responsiveness of his sensibility. stands, tables, the wall and the floor until he returns to his stool without having missed a beat. He is a jazz master, if not yet acknowledged as such by the National Endowment of the Arts nonetheless known to fans of improvised music worldwide. Here he’s playing a snare with his teeth or tongue, like Jimi Hendrix and Buddy Guy mouthing guitar strings. McHenry is a fine match, exploring horn motifs steadily, methodically, free to do anything/go anywhere but hewing to his own clear logic. Together, they exemplified a balanced partnership intent on physically generating and shaping sound. Thanks for the report on what sounds like a vibrant festival mixing generations and approaches. 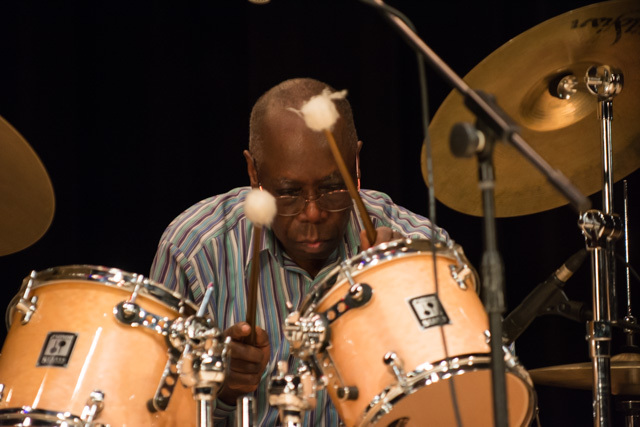 I particularly appreciate the space you offer Andrew Cyrille here. thanks Bob — Andrew is playing at his peak, should be heard! I'm a Chicago-born (and after 32 years in NYC, recently repatriated) writer, editor, author, arts reporter for National Public Radio, consultant and nascent videographer -- a veteran freelance journalist working on newspapers, magazines and websites, appearing on tv and radio, teaching at New York University and elsewhere, consulting on media, publishing and jazz-related issues. I'm president of the Jazz Journalists Association, a non-profit membership organization devoted to using all media to disseminate news and views about all kinds of jazz.